Tomales was sitting under its now familiar blanket of fog as we headed down Shoreline Highway once again towards Point Reyes Station. The plan this time, however, was to swing left towards the small town (hamlet?) 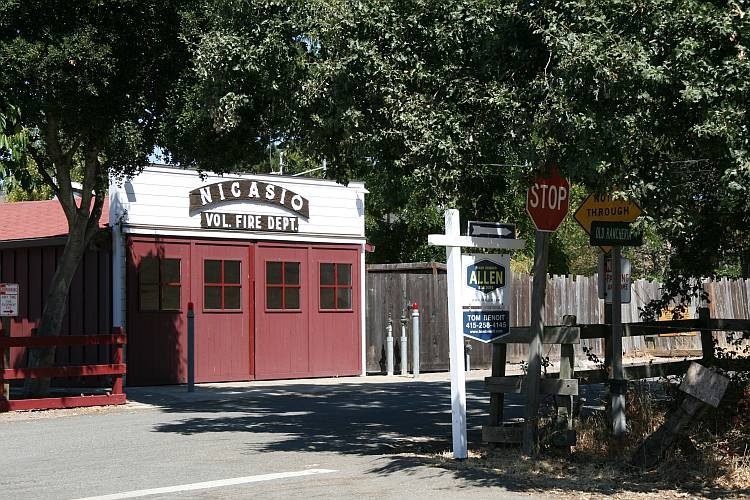 of Nicasio to meet Steve Delman for lunch. Being a Friday, Steve, in common seemingly with most of the rest of the planet, was working at home and had suggested meeting at a restaurant called Rancho Nicasio. As we approached, I couldn’t help but notice a lot of people on bicycles who were probably also “working at home”. What a jolly wheeze. The fog persisted further south and a little longer than yesterday; it was still overhead as we arrived but cleared very shortly thereafter with clear blue sky spreading up from Lucas Valley Road. I was devastated to learn from Steve that Lucas Valley Road was called Lucas Valley Road even before George Lucas moved in and developed Skywalker Ranch. Darn it! How the mighty are fallen. A place called Rancho Nicasio seemed like a natural habitat for a burger and so it was. I’ve been here for a week without having one but today I corrected my oversight. A real hamburger, as opposed to the various McTravesty of McJustice offerings, is actually a very good meal, even if a little hefty for lunch. Still, it has to be done; “when in Rome …” and all that. 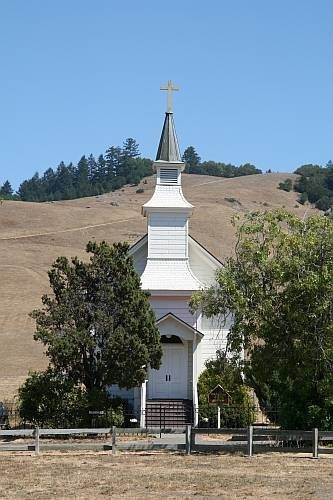 We tried to walk off some our fresh calorie intake by wandering around the time-warped sights of Nicasio afterwards but, alas, the place just isn’t big enough to burn many. Cute, though. Our other main required activity was stocking the house with food for the coming weekend. However, not being anxious to drive back to Tomales and under its now familiar fog blanket, we called in to a Petaluma outlet mall to spend more time in the sun and for Carol to indulge in some long-distance clothes browsing. This came within a hair’s breadth of turning into long-distance shopping when she found some trousers that appealed but the cash register line seemed to be stalled and, like the true champion she is, Carol returned said trousers to the rack. Sale lost. Petaluma Market came up trumps and provided us with some long-awaited sturgeon. I decided to spice it up slightly and accompany it with some black bean salsa, à la Delia, from the days before she sold out to “cheats”. It had a slightly muddier taste than I remembered but then, it is a fresh water fish, I suppose. Nature note: We’ve identified the local deer as native black-tailed deer. Bless Wikipedia.